Now that we are starting to peel off the layers this spring, I bet you haven't thought about peeling off those dead skin layers off your lips, have you? Over the winter, dull, dead skin layers have built up on your lips. While I have used a lip scrub every Sunday during my DIY Spa night and apply a great lip balm every night, it's the time of year when lips need a bit more. Enter bliss and this brand new really cool tool, the fabulips ‘pout’-o-matic. bliss fabulips ‘pout’-o-matic is a a pro-powered lip-perfecting tool that gently exfoliates to "peel" away layers off lips. The result? Softer, more smooth, kissably soft lips. 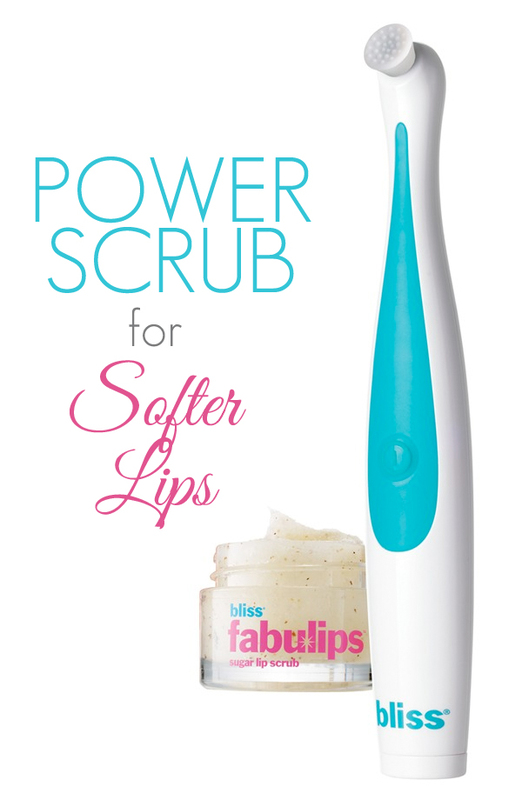 The fabulips ‘pout’-o-matic is the first oscillating polishing tool that targets the mouth. It is the only spa-powered lip smoothing system. It is so very unique with it’s custom designed rubbberized head with massaging nubs. These nubs buffs away flakiness and dryness gently and with ease, using bliss’ nourishing fabulips suagr lip scrub. Can I just say how much I love the scrub on it’s own? The ‘pout’-o-matic takes the scrub to the next level. My lips are left super soft and smooth and even somewhat plumps from the increased circulation brought forth by the motion of the tool. Do not mistake this for spa tool for a toothbrush. Using a toothbrush on your lips with a scrub is actually too harsh for your lips. You could use the fabulips sugar lip scrub with your fingers, but a hard toothbrush could tear the delicate lip skin and not work as well as the massaging nubs on the tip of the fabulips ‘pout’-o-matic. The bliss fabulips ‘pout’-o-matic sells for $48.00 at blissworld.com and retailers such as Sephora and Nordstrom.